Retina specialists who educate patients about the dangers of smoking can help prevent ocular damage. In the 30 years that I have been a practicing comprehensive ophthalmologist I have noticed that, when patients have potential posterior segment problems, they are keenly aware that the viability of their eyes and eyesight is in jeopardy, and they will always listen to what their retina specialist advises. Therefore, I believe that you, my retina colleagues, are in a unique situation of being able to discuss ocular preventive care and have patients adhere to these recommendations with a high degree of success. • Smoking increases the prevalence and extent of associated ocular damage in macular degeneration, diabetic eye disease, and glaucoma. 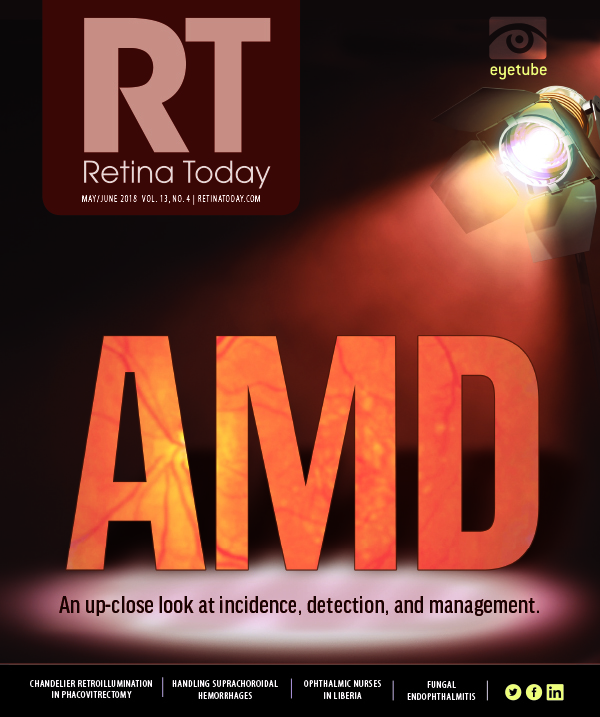 • Dealing with a population of patients who often have vision-threatening diseases, retina specialists are in a unique position to try to get patients to heed their advice about smoking. • Having these conversations with patients who smoke could help to lower the rates of ocular diseases. Ophthalmologists know that smoking significantly increases the prevalence and extent of ocular damage in all three leading causes of blindness in adults in the United States: macular degeneration, diabetic eye disease, and glaucoma.1-3 Furthermore, in many other ocular conditions, such as thyroid eye disease, smokers have far more serious and far longer durations of ocular complications.4 We witness the complications associated with smoking on a daily basis, yet most ophthalmologists are hesitant to talk to patients about it. The rate of noncompliance is exasperating, and many ophthalmologists believe that this topic is better suited for discussion between the patient and his or her primary physician. Over the years, I have found that 99% of my new patients are unaware of the deleterious effect that smoking has on the eyes. I wish I could tell you that the majority of my patients stop smoking once I discuss the consequences of their habit with them, but that’s not the case—although my staff and I believe that approximately 50% of our patients who smoke do in fact stop at some point. Many of them stop right away, but others need to hear the same message repeated at subsequent examinations. What usually accelerates the quitting process is when the patient, or a family member of the patient, has macular degeneration, glaucoma, or diabetic eye disease. Why? Because they fear their continued smoking will push their vision off the proverbial cliff. 1. Smoking can lead to vision loss or blindness. New York State Department of Health. health.ny.gov/prevention/tobacco_control/smoking_can_lead_to_vision_loss_or_blindness.htm. Accessed May 21, 2018. 2. Smoking and the eye. American Academy of Ophthalmology. April 27, 2017. aao.org/eye-health/tips-prevention/smokers. Accessed May 21, 2018. Which brings the discussion around to you retina specialists. Your patient base consists of individuals with posterior segment pathologies who are concerned about maintaining their eyesight for the long term. These patients are a captive audience, and often they are open to any information you provide. I am committed to my own “Cease to Smoke” campaign with patients in my practice. My goal is to see a dramatic drop in diseases caused by or aggravated by smoking. Hearing the cessation of smoking message from primary care physicians rarely resonates as well as it does when patients hear it from an ophthalmologist, particularly when they are having ophthalmic issues and are desperate to preserve their eyesight. 1. Zhang X, Kahende J, Fan AZ, et al. Smoking and visual impairment among older adults with age-related eye diseases. Prev Chronic Dis. 2011;8(4):A84. 3. Pérez-de-Arcelus M, Toledo E, Martínez-González MA, Martín-Calvo N, Fernández-Montero A, Moreno-Montañés J. Smoking and incidence of glaucoma: The SUN Cohort. Medicine (Baltimore). 2017;96(1):e5761. 4. Thornton J, Kelly SP, Harrison RA, Edwards R. Cigarette smoking and thyroid eye disease: a systematic review. Eye (Lond). 2007;21(9):1135-1145. 5. Belkin M. Smoking and the ophthalmologist. Br J Ophthalmol. 2006;90(11):1337-1338. 6. Asfar T, Lam BL, Lee DJ. Smoking causes blindness: time for eye care professionals to join the fight against tobacco. Invest Ophthalmol Vis Sci. 2015;56(2):1120-1121.